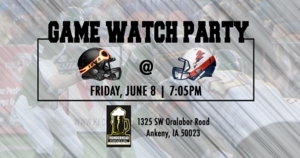 Cheer on the Iowa Barnstormers at Thunderhead Sports Bar & Grill this Friday, June 8 as they head to Sioux Falls, South Dakota to take on the Sioux Falls Storm and battle for home field advantage in the playoffs! Kickoff is at 7:05pm. Enjoy great food and drink specials starting at 6:00pm!